The “I Love New York” signs that line New York’s highways will start coming down, according to state transportation officials. Gov. Andrew Cuomo’s administration announced Feb. 2 that the signs, which have been the subject of federal disapproval for years, will be taken down. The announcement comes one day after the Federal Highway Administration sent a letter to New York transportation officials saying the agency will dock $14 million in funding from the state unless the signs are removed. According to FHWA, the $14 million will be restored if the state removes the signs by Sept. 30. In a joint statement, New York’s Acting Transportation Commissioner Paul Karas and Executive Director of the Thruway Authority Matthew Driscoll said the signs will be removed — and replaced — before the deadline. Federal officials previously asked Cuomo to have the signs taken down for safety reasons, but he refused. According to FHWA spokesman Doug Hecox, the signs violate regulations outlined in the Manual on Uniform Traffic Control Devices. The agency has claimed the signs are potentially hazardous because they contain too much information and could distract drivers. In addition to highlighting nearby attractions, the signs list the addresses for the state’s tourism website and the “I Love NY” app. 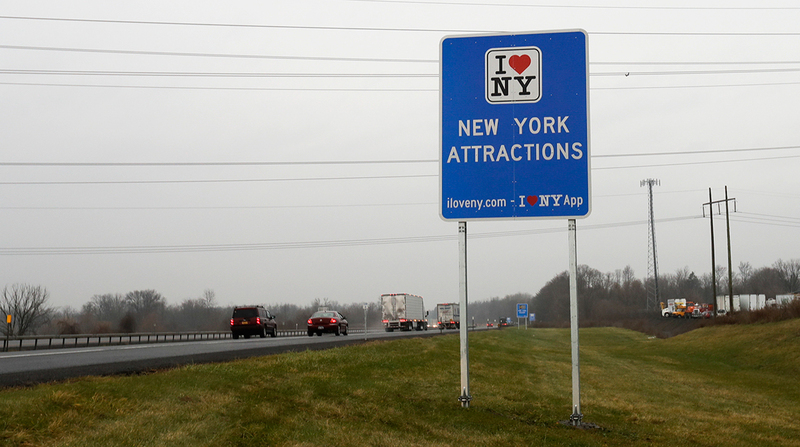 Since 2014, New York has spent more than $8 million to install the 514 signs as part of a tourism campaign, despite FHWA forbidding the state from doing so. According to a statement from the New York State Department of Transportation, this branding effort has resulted in an 18% increase in the number of tourists to visit the state. NYSDOT also said that the new signs will likely need to be approved by FHWA. Hecox said FHWA looks forward to working with the state ensure New York’s signage complies with safety standards required to qualify for federal funding.